Just How Quickly Did Ichiro Used to Get Down the Line? Door number one is probably the most common. Door number two is the majority of the offseason, and while those sometimes feel contrived, they’re the most necessary and topical. Door number three is almost always the most fun, both for the writer and reader. What follows is sort of a mixture of what’s behind doors one and three. See, I was reading an article the other day written by Mike Petriello, formerly of FanGraphs and who’s now doing excellent work for MLB.com, usually using or explaining Statcast numbers. Mike wrote about which players, according to Statcast, got down the line from home to first the fastest. Billy Hamilton wasn’t the fastest, but he was third-fastest. Dee Gordon was second. Billy Burns, surprisingly, or maybe not, was number one. No matter the order, these three guys are the kind of guys you’d expect. They’re young, they’re obviously extremely fast, they steal plenty of bases, they’re all very relevant; this all passes the smell test, and why shouldn’t it? Mike’s parenthetical bewilderment says it all. Ichiro! Ichiro is still one of the five fastest players (from home to first) in baseball at 41 years old! Let’s run through our smell test checklist from just a second ago and apply the criteria to Ichiro. Young? Ha, nope. Obviously extremely fast? Eh, debatable, at this point. Steal plenty of bases? Nope. Very relevant? Mostly when pitching. So, Whiting, who wrote an entire book on Ichiro, has him at 3.6. bud, whose comment came two years prior to Whiting’s book and therefore could not have been citing Whiting’s work, independently verifies the 3.6 figure. duckshirt, whose comment was posted during Ichiro’s age-36 season, reports a slightly slower time of 3.70-3.75. None of these claims provide any supporting evidence, of course, but nobody lies on the internet. It’s important to note, too, that Burns’ league-leading time was 3.85 seconds, and Hamilton’s 3.95 ranked third. Petriello’s study only considered players’ 90th percentile times, to isolate max-effort sprints, and the clock starts with bat-to-ball contact, and ends with foot-to-bag contact. The three times turned up by our Google search would put Ichiro head and shoulders above his modern-day competition. But we can do better than a Google search. This is 2016. We can also do a YouTube search. It took some digging, but I’ve got here five clips that provide us a bit more information. This is fan-shot footage by sinoBaseballer from 2010, and I’ve got Ichiro clocked at 3.88. Not entirely impressive, but Ichiro’s also 36 here, got a poor jump out of the box (in Ichiro terms) and slowed down when he neared the bag and realized there was no throw. This is still Burns’ speed to first, and Burns was the quickest player in baseball this year. But we can do better. Still not the greatest Ichiro jump, but it’s better than the last one, and this time he’s in a full sprint all the way through the bag. Our time here is 3.75, and if this were the norm, it would be the fastest in baseball by a full tenth of a second, which is substantial, in sprinter’s terms. But this clip is also from 2010, when Ichiro was 36 years old. There’s got to be footage of early Ichiro running full speed, right? I sifted through about a half-hour of entirely Japanese videos to find these next couple clips, but they were worth the effort. This is from 2001, Ichiro’s rookie year, when he was 27. This particular clip isn’t perfect, seeing as first base isn’t pictured, but based on the lunge, and the way Ichiro’s body recoils when his front foot lands after the lunge, I’m fairly confident in my ability to have timed this correctly. I’ve got Ichiro at 3.79 here. We can still do better. Another clip from the Japanese side of YouTube, again from the 2001 rookie season. Now we’re down to 3.74. Our fastest recorded time yet. Still not the fastest. Now we’re talking. This is from the 2001 All-Star Game, and here, a 27-year-old Ichiro goes home-to-first in 3.66 seconds. At 41 years of age, Statcast has Ichiro’s average 90th-percentile home-to-first time clocked at 3.98 seconds, good for fifth-best in baseball. That is remarkable on its own. The couple clips we have from 2010 would seem to indicate that 36-year-old Ichiro got down the line at max-effort somewhere in the 3.80-3.85 range, which would likely make his max-effort average the fastest in baseball today. Going back to 2001, though, in prime Ichiro years, our strongest two data points have Ichiro in the mid-3.70s, and as low as the mid-3.60s. 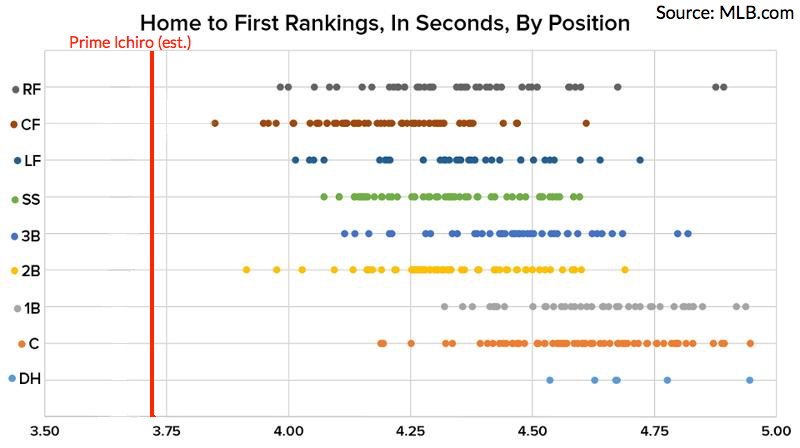 Knowing what we know, I don’t think it’s unreasonable to conclude Ichiro’s peak max-effort home-to-first average was around 3.75 seconds, perhaps even a hair faster. That’s significantly quicker than any of today’s fastest players. You could move the line around a bit if you have any reason to believe the last two clips were outliers rather than the norm, but no matter how you slice it, Ichiro’s home-to-first time in his prime is unmatched, and in all likelihood, unprecedented. We may never see anything like it again, because Ichiro’s home-to-first time wasn’t just about his raw footspeed — he was fast, but I have my doubts whether prime Ichiro could beat Billy Hamilton in a 60-yard dash — but it was more about the running head start in his swing. His freakish ability to control the bat head, which allowed him not only to make contact at an elite rate, but seemingly to place the ball wherever he wanted while taking a running head start. The swing was unlike anything baseball had ever seen. That’s the entire PITCHf/x era, and practically the entirety of Ichiro’s major league career, and he’s got nearly twice the infield hits as the next guy. That’s partially because Ichiro’s also batted more than anyone in the PITCHf/x era, but even on a per-plate appearance basis, Ichiro is the modern infield-hit king. Hell, even since he turned 40, only Dee Gordon and Starling Marte have him beat in that regard. This all got me wondering about another question with no right answer: how much was the running head start worth over Ichiro’s career? Just the couple steps during the swing? You’ve gotta think those couple steps earned him, I don’t know, a hundred or two extra infield hits? Plus a handful of would-be singles that became doubles, and doubles that became triples? If we believe the running head start netted Ichiro even 100 extra hits, and the run value of a single is a little less than half a run, I don’t think it’s unreasonable to think that those one or two steps Ichiro took while swinging, just the head-start, has been worth upwards of 50 runs, or five extra wins, over the course of his MLB career. That’s just a wild guess, and again, none of this is supposed to be a revelation. We’ve long known Ichiro got down the line exceptionally quick. We’ve long known he’d mastered the art of the infield hit. But now, we’ve got context for today’s fastest players, and from what I can tell, none of them could hold a candle to Ichiro in his prime, at least in terms of getting from home to first. Hell, they can barely beat him now. Sometime this year, barring injury, Ichiro will record his 3,000th major league hit, cementing his already-ensured place in baseball’s Hall of Fame. 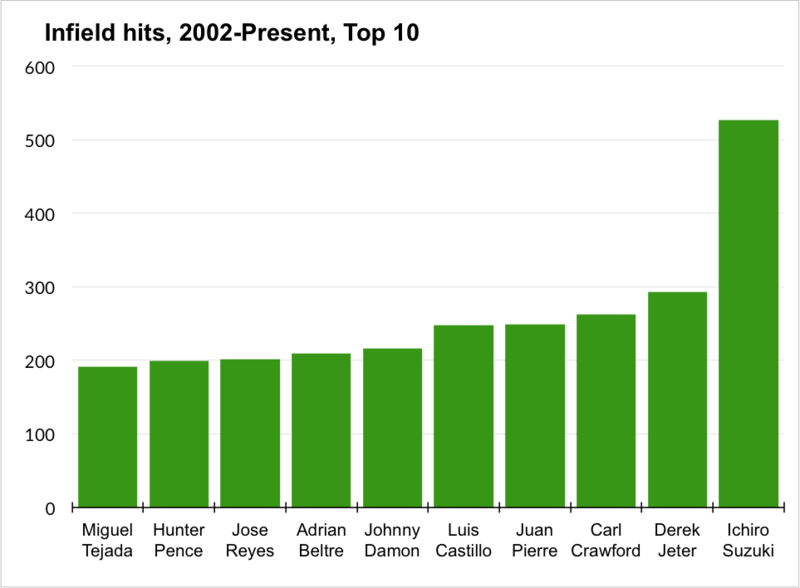 Plenty of players have reached 3,000 hits. None of them did it like Ichiro. We hoped you liked reading Just How Quickly Did Ichiro Used to Get Down the Line? by August Fagerstrom! Always beware the letsrun.com rantings. They can bring a world of hurt.